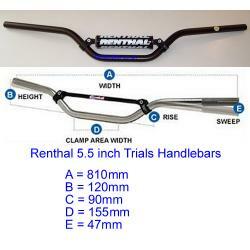 Renthal Trials Handlebars 5.5 inch rise. Black with bar pad. Renthals Trials Handlebars 5.5 inch rise in a black finish. Supplied with a black Renthal Bar Pad pre-fitted. For more information on the dimensions, please click on the image to enlarge. Delivery Information UK - Due to the dimensions of this item it will normally be posted by Royal Mail Standard Parcels (3-5 working days), unless part of a larger order, when a courier would be used.